Today, we have two major software about 3D text and logo creation, they are XARA 3D Maker 7 and Aurora 3D Text & Logo Maker (Mac & Windows). XARA developed in the late 1990s, the style with a clear characteristic of the times, Aurora 3D Maker(Mac & Windows) was developed in 2000, the main modern style side, two software are used to quickly create titles, logos, icons and buttons and Introduction . 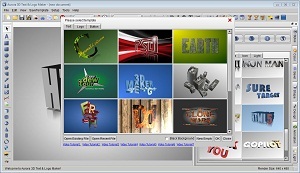 There can output high-quality 3D text and graphics. Here we have the software in all aspects of their evaluation. First, the software starts, we can see between the two software is a clear difference. 1. Aurora 3D Maker (Mac & Windows) supports multiple object editing and freedom of placement, and Xara3D supports only a single object. 2. 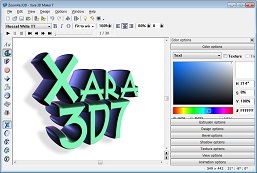 Manipulator: In 3D production requires operator, the first two software are included in the shape of an object and text, XARA so because only a relatively simple object, click the blank is rotated, click on the text side is stretched, or by ctrl alt key to switch the stretching and rotation. The Aurora 3D Maker(Mac & Windows) requires placing multiple objects, provide a more powerful operator, including the movement of each axis, rotation and scaling, and surrounded by the right side of the six body shapes and text bevel adjustment, size, and pull extension button.